We’ve been in Costa Rica for seven months! If you pay much attention to our blog you’ve noticed that this is the first blog post in a very long time. (However, we send emails bi-monthly & short facebook posts regularly. Hopefully you’ve stayed up-to-date with us one of those ways!) Now, I’d like to take a quick trip down memory lane & share our world here in Costa Rica with you a bit more. In April 2018 we reached our financial goal & set plans to move June 7th. Packing, sorting (what stays, what do we ship, what goes on the plane & what just has to go anywhere but with us?! ), visa paperwork & readying the house to be sold filled our last weeks in the States. And there were the many many goodbyes. Goodbyes to people & places. I’m grateful we visited our favorite parks, Lake Michigan, ice cream shops and other favorites purposefully as a family prior to moving. It wasn’t until I moved abroad that I would realize that I actually would miss places more than I anticipated. People, of course. I knew I’d deeply miss many people. But I was struck by surprise at missing quite a few places. Just looking at this picture makes me both happy & sad. It reminds me that the kids bring up missing our home in Waukegan and it still holds place #1 as their favorite house we’ve lived in. In June we arrived in Costa Rica! Mom/grandma came with us our first two weeks & helped with the kids. This meant when we hit the ground we could work quickly getting our home set up with furniture & making it livable. We were also able to get the kids enrolled in school prior to my mom leaving. She is such a blessing to us! We arrived in Costa Rica having joined the San Jose City Team. This was the team we had visited on our Vision Trip two years prior. However, many changes had taken place over the last two years & what was once a very large team had become a very small team & the other couple of remaining members had plans to move back to the US when we arrived. As of December the SJCT ceased to exist. Through the help of ReachGlobal leadership & prayer it was determined that Carlos would best be able to receive the support he needs & still work in the area of leadership training by joining LACRET (Latin America Caribbean Regional Equipping Team). His team is spread throughout Latin America. They meet virtually regularly & there are over 300 combined years of leadership training experience in Latin America & wisdom to glean from others on the team. Some other “oh…that didn’t work out how we’d planned…” items include that due to extremely odd, difficult & disgusting (ex. sewer water made to intentionally back up in our home) circumstances with a neighbor we decided to move from our first home in Costa Rica in October. We are now happily settled into a new home & grateful we made the move. We miss having a yard… But the house is actually nicer than where we were, more ideal for hosting, we feel safe here & it’s still in a great location for getting around the city & the many trips back and forth I make to the kids’ school. We had hoped to initially be part of a new church plant. But that didn’t work out the way we had thought it would either. Carlos is often, as anticipated, visiting different churches & the kids and I are regularly attending a church that has three services. It’s much bigger than we are used to & admittedly I feel a bit lost at times having not made a ton of connections there yet. I don’t know what the future holds for us in this regard but for the time being this is where we are. We would like to be plugged in more, serving in the church & see our kids make significant connections. The kids have done amazing as they too have experienced many transitions & some unpleasant experiences. There have been some new health situations for Elijah & he has quite a few doctors’ visits each month. Ale experienced a bit of bullying for the first time at school but we’re grateful it was handled quickly. They miss family, friends & surprise me at times with what seems to trigger a memory or longing for a place or a person in the US. We knew…because life anywhere is this way…there would be ups & downs. We knew that due to the many losses we’d begin to grieve & culture shock we’d experience that perhaps there’d be more downs than normal for a period of time. We knew that ministry plans & ministry reality wouldn’t all line up just perfectly. We didn’t know in what form they’d come, but we knew the challenges & disappointments would come. I’m grateful for all of the preparation ReachGlobal provided us and the resources available to help us through the challenges we faced in our first half a year on the field. In the midst of the challenges we’ve experienced great joys too. One great joy we have experienced is becoming friends with another missionary family here in Cartago. They serve with ProMETA which is based out of Costa Rica. ProMETA is the seminary where Carlos (via online) is getting his master’s degree. They welcomed us & have been a tremendous source of support & information. They’ve guided us through & given us head’s up on the many governmental hoops we’ve had to (& still have to…) jump through in regards to residency, drivers licenses, the public healthcare system, etc. But more importantly they’re fun to be around, wise, caring & people who understand what it’s like to be living cross-culturally as missionaries. They are a tremendous blessing to our family. 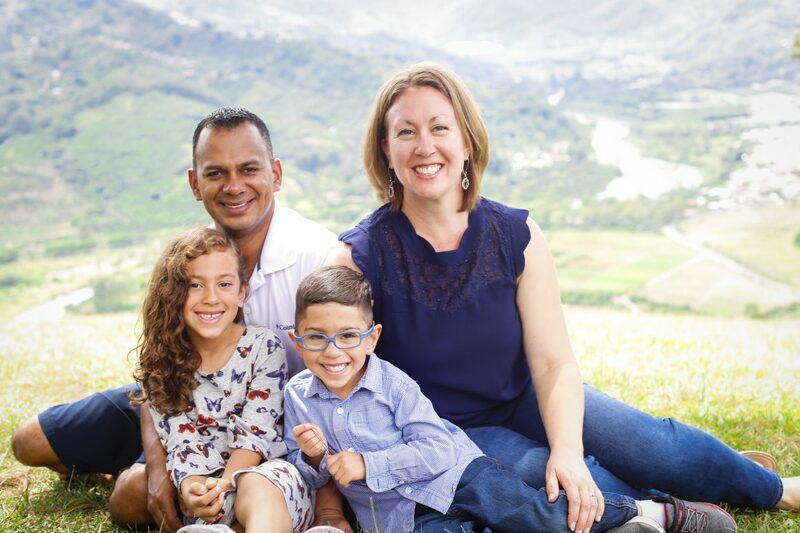 Likewise there are a handful of tico (Costa Rican) families/individuals who have gone out of their way to help us, welcome us & connect with us. They’ve been subjected to countless questions about just about everything…can you recommend a doctor/dentist/lab/vet/butcher/mechanic? Where can I find…brussel sprouts (it’s been a fruitless quest so far unfortunately)/this, that, the other school supply/school uniforms when it’s mid-year & they’re nowhere to be found? How do I get logged onto the kids’ online school platform? How much should we pay a babysitter? Can you recommend a babysitter…? Do you pay the guys that supposedly watch your car while you’re parked downtown? Do you pay the neighborhood guards? When do we have to renew the car sticker? How do we do that? What does diay/en aguas/bulto mean? The ticos sure do have a unique vocabulary. Each Spanish speaking country has its own particular terms for certain things…but we think the ticos take it to a new level 🙂 These tico friends have welcomed us into their homes and taken the time to help us learn, they’ve celebrated our kiddos first birthdays in Costa Rica with us, took in Ale for a night prior to Elijah’s surgery so she wouldn’t have to sit around the hospital for hours, they’ve laughed with us (or at us, ha ha!!) & encouraged us as we’ve stumbled through some challenges these first few months adjusting. While we are working on getting to know many people…there are some that have already become significant friends & we are grateful to God for this provision. We look forward to this new year with joy. I have hopes that we’ll have a smoother school year as we’ve got a little bit of experience under our belts now as to how the system here works. Carlos continues to form relationships with pastors & leaders & we pray that this year a larger pastors’ network could begin. We are praying about running the Alpha course. I’m praying to see in what ways & where I can serve outside of the home at church and in the community using my gifts. Ok, this isn’t deep, this is just by far the question we get most often! We wish we were at the point that we had a solid answer to that question. Most missionary work, including ours, involves raising the necessary financial support involved to move, minister and live on the mission field. Our goal and prayer is still to be heading out by the end of summer 2017. We have felt the Lord’s leading, we’ve said yes and we want to get to the field and begin serving alongside of pastors and leaders as soon as possible. Our passions and calling line up with identified needs and opportunities currently available in Costa Rica. We didn’t chose Costa Rica, rather, we feel we’ve said “yes!” to God’s leading to go and partner with the work He is doing and wants to do in Costa Rica. A year after we got married we moved from Honduras up to the States. The largest factor in that move was so that both of us could continue our studies. The last 10.5 years has been about a lot more than just continuing education. We’ve sunk in roots, picked up (in my case) with old friends and made lots of new friends. We’ve been blessed to be near my family. We’ve continued to serve together in our church and community. We’ve weathered serious health concerns in our family and other difficulties. We’ve celebrated the births of our two amazing kids, Carlos’ US citizenship, degrees completed, birthdays, the end of each school year (as a teacher – it’s worthy of celebrating – trust me! ), and countless other large and small joys God has blessed us with. Carlos has learned English and experienced living in a new culture. We’ve had all kinds of ups and downs and twists and turns along the way. We’ve grown stronger as a couple and more in love. We are so grateful for these years we’ve had here. But…. It literally went without saying that we’d one day move back to Latin America…and that meant, to Honduras. But, that’s not how this story goes. Just another twist along the path. We looked at many ministry opportunities across Latin America. We were drawn to an opportunity with ReachGlobal in Costa Rica that lines up with Carlos’ passions and gifts. He is passionate about serving leaders, he’s a networker, loves getting things off the ground and loves to get people working together. We entered into a process of learning more about ReachGlobal and the needs in Costa Rica. Pastors and leaders are asking for help in Costa Rica to help build unity and desire access to solid theological and ministerial training. Through much prayer, wise counsel and our visit to Costa Rica we felt peace, and continue to feel peace, that this is the Lord’s leading. My interest in Spanish and Latino cultures really began in junior high. For several years I regularly volunteered with an after school program for young Hispanic children that met at my church. In high school and college I had several opportunities to participate in short term mission trips to Mexico. My interest in cross cultural…well, everything, just kept growing. On my first two-week long mission trip as a 15 year old I went forward during a final service in which we were asked if we felt called to be a missionary. I’ve struggled to share this experience from when I was 15 because I wasn’t always sure of the call; I second guessed it…and, later on, I guess I tried to ignore it. It’s hard to fully explain the things that God simply places in one’s heart – an interest and love for other places and cultures. Along with that is the feeling, the draw, the call that God has something else for our family elsewhere. Carlos and I met in Honduras when I was there as a short term missionary (for several years) in my early 20’s. Carlos was at seminary, helped lead his church’s youth group, preached occasionally and also volunteered with the national youth ministry. We met volunteering together with that youth ministry. We were an odd pair from the beginning: US suburban girl meets rural Honduran boy in the capital of Tegucigalpa. We both grew up in Christian homes. That’s about the extent of what we have in common in our upbringing. And, even that common ground was lived out in each of our families differently. What brought us together? I think that the true beginning of the connection that developed between us was that we both saw in the other a person who loved the Lord, loved others and wanted to serve in ministry. Carlos felt called into full-time ministry prior to us meeting and he was praying for a wife who loved missions. He has faithfully continued his studies as he has felt called to better prepare himself for future ministry opportunities. He has continued to grow and expand his understanding and view of effective and healthy leadership and churches through many ministerial experiences and through relationship with other leaders. The evangelical church is growing numerically in Latin America. However, many of those leading the church in Latin America have had little to no training. Helping support the church leadership in the areas of leadership development, theological & ministerial training and mentoring are vital to the health of the church in Latin America. We’ve been called to come alongside of nationals and support the Latin American Church. We love Latin America and have a great passion for spreading God’s love, hope and truth in Jesus to the nations. Now, a question for you: Will you join us? We’d love to talk with you about partnership. Please check out how you can partner with us here and please get in touch to find out more. We’d love to have you along on this journey with us! What seemed like a perhaps inevitable, but probably still distant, return to Latin America is now upon us. We are so excited to share with you that we have been accepted on staff as ReachGlobal missionaries. We are excited about how God has been leading us and for what lies ahead. Perhaps most surprising for us is that at this point we aren’t headed back to Honduras! However, we’ll be a lot closer to Honduras than Chicago. We believe God is leading us back to Central America, specifically to Costa Rica. We are praying to be headed to Costa Rica the summer of 2017! We just got the dates of our Vision Trip set up for July. This trip is part of the process to confirm our placement. We feel that the opportunities and needs in Costa Rica line up well with our gifts, passions and calling. We are excited to meet the San Jose City Team and get a feel for the ministries as well as what life will be like for our family in San Jose, Costa Rica. What are our current next steps? We have begun the process of seeking out both prayer and financial supporters to come alongside of us. Will you join us? Please check out the other areas of the blog for more information!